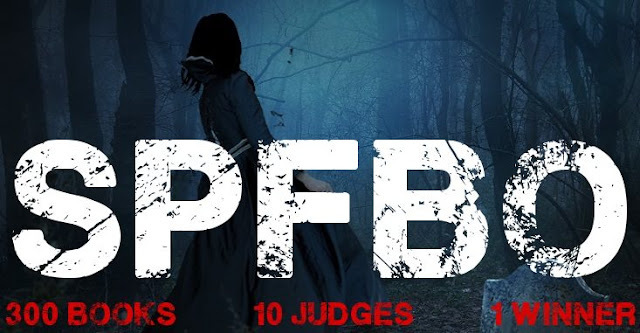 Mark Lawrence: SPFBO 2018 - A call to authors. Please spread the word on whatever forums/groups you are on. We will only proceed if we get to 250 entries. Read about the SPFBO here. i) No book that was entered in a previous SPFBO can be reentered into SPFBO4. viii) No updates after submission - that just makes things too complicated. Not a rule, a guideline: The blogger you are assigned to shouldn't know you or have already reviewed you. If you are assigned to a blogger you "know" (have met, chatted to online etc) let me know. The bloggers who will consider the entries, and the duties they have volunteered for are given HERE. The winner will receive the prestigious Selfie Award but the true prize is the publicity of being the winner, plus the bonus of being reviewed on the blogs of 10 highly respected fantasy bloggers. All you have to do is email me the electronic manuscript ready for kindle/PC reading or (if one exists) the link to the FREE version on Amazon. You're welcome to include a cover letter, blurb, synopsis etc as you would for an agent - but it's not compulsory. These guys are bloggers, they're used to making up their mind by starting to read and seeing if they feel any compulsion to continue. You may find other interesting links by Googling SPFBO or searching for the hash tag on twitter & join us on Facebook too! List as of 8pm GMT 17th of June. If you should be on it and are not ... let me know! Awesome to see that it's on! Submission sent! Assuming there are enough entries by August 1 (because they'll be full by the end of this weekend, I bet), when will the "start date" be? The start date will still be August 1st, though bloggers will be welcome to get a headstart on the reading etc. So excited to be following SPFBO4 from the start! Hi. Does the novel have to be originally self-published? I have a novel that was released by a publishing house, but when it went out of print I revised and self-published it. Would that qualify? Awesome! I'm so excited about this! It's wonderful that you do this for self-published authors. Last year, I didn't have a new Fantasy book that was stand-alone or first in a series. This year, I have two. I also enjoy the SPFBO as a place to find great books by other authors. The Finalist and Semi-Finalist lists are wonderful! Nathaniel Rane - He Who Fights is the title and series name. It is written by Mike Morris. Hi! I sent you an email to participate with The Prince of Arabia. What's the meaning of + symbols? I have followed every blogoff with great interest and have an eligible book this year, so this time I am taking part! Hi Mark - I assume that "electronic manuscript ready for kindle/PC reading" includes .Mobi right? I'd think so, but saw some discussion on FB that epub was the right format. Hi Mark - I assume that "electronic manuscript ready for kindle/PC reading" includes .Mobi files, right? I would assume so, but saw some discussion on the FB group that epub was the right format. Looks great. A nice long list. Look forward to the outcome. I sent a Mobi of my book and assumed everything was Ok, but some of the chatter on FB makes me wonder if I did it wrong. Was I supposed to send Epub format instead? And was I supposed to send a separate cover image? This question is for next year, does the novel have to be adult fantasy or can it fall into YA fantasy or middle grade fantasy?